GamerDNA - What Kind Of Gamer Are You? 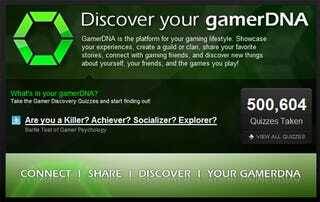 GamerDNA isn't just another social networking site for gamers. GamerDNA is a site that seeks to help define us as gamers. Using the results of quizzes such as the Bartle Test of Gamer Psychology, which classifies the personalities of MMO players, along with gameplay history drawn from sources like Xbox Live, Xfire, and Steam, GamerDNA establishes your unique fingerprint, which can then be used to match you up with gamers with similar tastes, or suggest games your activity indicates you might like. It's almost like the popular musical discovery service Pandora, only for games. It's definitely worth checking out, and who doesn't like sitting around at work filling out quizzes instead of putting covers on their TPS reports? They've just surpassed the 500,000 quizzes taken mark,and that couldn't have all been me. Hit the jump for more information, or better yet, just go to the site. GamerDNA, Inc. Quiz System Reveals Gaming Preferences of 500,000 Gamers Quizzes to become a key element of company's gamer identity and discovery platform CAMBRIDGE, MA – September 19, 2008 – GamerDNA.com, the social platform for videogame identity and discovery, today announced a milestone 500,000 quizzes have been completed on the site by gamers looking to define their gaming preferences, interests and unique gaming identity. To celebrate the initial success of the quiz system, GamerDNA will further expand their gamer identity platform in the coming months with the addition of new quizzes, aggregation of more gameplay information, and new tools for discovering games. "The quiz system is central to the identity defining capabilities of GamerDNA.com and we are thrilled with the positive response that it has received thus far from the community," said Jon Radoff, CEO of GamerDNA, Inc. "Our goal was to have quizzes on the site that are fun to take and that also help us to define what we, as gamers, find interesting. The quizzes not only enhance our identity platform, but also help us to draw unique insights from the collective intelligence of people involved in the culture of gaming." The Bartle Test of Gamer Psychology, a quiz that classifies the personalities of massively multiplayer online game players has quickly become the most popular on GamerDNA.com. Additional quizzes on the site measure the play styles of other gaming genres, such as first-person shooters and real-time strategy games, as well as a quiz that measures which decade gamers feel have had the greatest impact on their game preferences. After completing each quiz, a "facet" system shows participants a set of personality traits that represent their unique "fingerprint" as a gamer. Gamers can participate in these quizzes, as well as view current result summaries, by visiting www.gamerdna.com/quizzes. GamerDNA aggregates each member's gameplay history from popular networks including Xbox Live, Xfire and Steam. When this-real time information is combined with feedback about game preferences and quiz results, it enables a member to define their unique "gamer identity," a lens for discovering new games, showcasing experiences and exploring the experiences of others who love games.